Rice Bucket Challenge: Looking Back and Praising God. When I was young, my family could only afford to buy rice by the kilos. In the Philippines, growing up, I noticed that only the rich can afford to buy sacks of rice. When we ran out of rice, my mom would give some money to buy rice at a convenience store in our neighborhood. We were happy when we had rice even if there was no special dish to go with it. Sometimes, because money was scarce, we kids were happy when we had boiled rice with milk and sugar, or boiled rice with “sardines” or with “ginisang kangkong, “ or even with “ bagoong” (salted shrimp paste) or with “patis.”( fish sauce). Having those to go with boiled rice was enough for us kids and we were happy. Who would have thought that many years later, the ministry I am involved with now would be, by the Grace of God, providing sacks of rice to our partners ministering to the needy. Such is the grace and Mercy of God. Muslims in Mindanao. We gave 10 buckets of rice (about 200 pounds at $ 100). Many of our friends and donors have responded to our Rice Bucket Challenge. In the beginning, we started giving to MEANS ministry partners 50 kilos of rice (one sack of rice) which is equivalent 5 big buckets of rice (100 pounds). We realized that there is a great need for our rice eating ministry partners in Thailand and the Philippines. Six years later, sacks of rice are now being shared to many of them. Our donors in the US have enthusiastically responded to the challenge. The year 2018 was significant to MEANS. Last year, 305 sacks of rice (33,990 pounds) were distributed to 17 organizations including Bangkok Bible Seminary and Elpis Ministries inMaesot,Thailand. Many stories have been shared to us about God’s goodness and provision for rice. Here are some of their stories. Through your generous help, MEANS will be able to continue to supply rice to them. They consume 6 sacks of rice each month to feed Faith House migrant Burmese girls and the village children that visit their compound every weekend for Bible teaching and feeding. Pastil is a Maguindanaon ( Muslim ethnic group) recipe using boiled rice topped with meat, fish or chicken, then wrapped with fresh banana leaf. 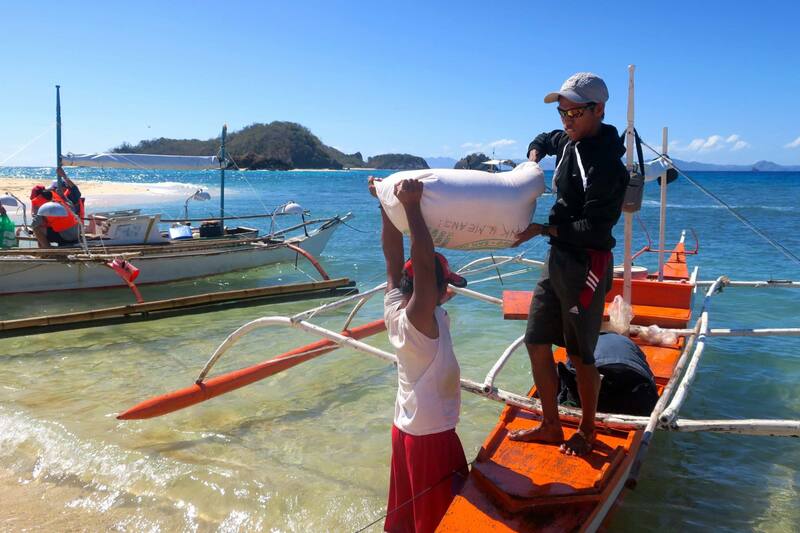 RICE transported to an Island in Coron, Palawan, Philippines for New Tribes Missionaries. So many stories have been woven in 2018 by God’s powerful and merciful hands. They are so many to be counted. We have been surprised many times as to how these stories unfolded. To us they are like tapestries. When you look at the back of a tapestry that is being woven, it looks like a mess. You would see knotted threads with different colors. It is difficult to figure out the shape of what is being woven. It is opaque, vague and undefined. But we do not look at the back of the tapestry with its many knotted details and colors. We look at the front part and admire how beautiful is the finished work of art of the weaver. God is our Master Weaver. He is the Master Designer, the One who keeps on weaving to make beautiful tapestries of stories for His children. The stories we share with you here come from our ministry partners. These are stories that came out of what God wanted us to do – to build the Kingdom of God in places where He should be known as the Lord of all. Behind each story is the hand of God at work in unique and different ways in each person’s life. 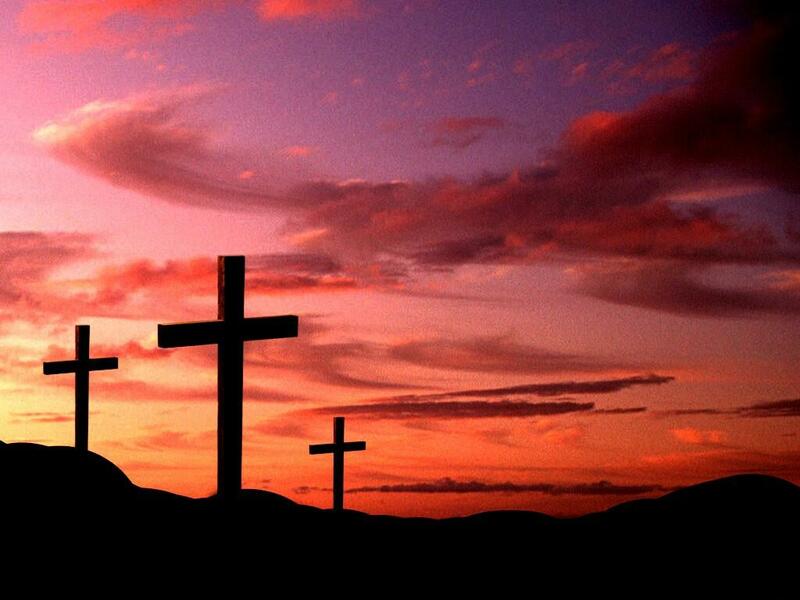 We ask that you open your eyes so you can see the work of God and give praises to Him Who deserves it all. In our partnership with IVCF Tacloban (Eastern Visayas), we aim to help them apply what they are learning from their Bible studies by reaching out to their own community. Since December is the season of gift giving, the timing was perfect! 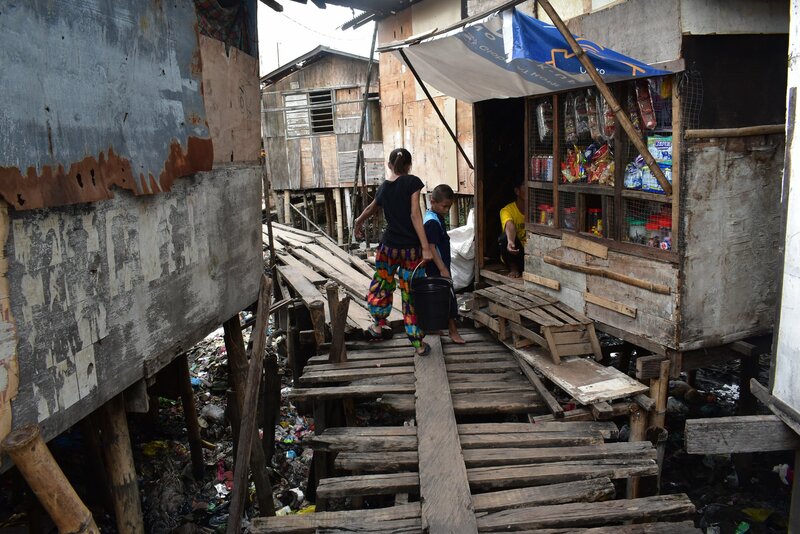 With the support of MEANS, a plan was conceived to distribute flip flops to children at a Haiyan survivors’ relocation community – Barangay Guadalupe in Tacloban City. When a group of graduates, IVCF students and staff went there, the children and parents welcomed them with joy. They taught songs, dances and games. There was food and distribution of flip flops afterwards. A volunteer shares: “The impact of our community outreach in my personal life is that it has inspired me in my role as a leader and a social worker assistant. I was challenged to be more faithful and to have a kind heart. I want to be a good person by doing good things and to share good deeds. The experience has helped me to become a better follower of Christ. I learned that it is indeed better to give than to receive. “ – Alfred John Perez de la Cruz, 1st year civil engineering student. On December 23, 2018, an IVCF group with 8 students, 6 graduates and 3 IVCF staff visited the Badjao Church community in Mambaling, Cebu. This is the first time that our ministry partners together with student volunteers and graduates under the leadership of Belinda Basas, a university instructor in Tanauan, visited a jail in Burauen, Leyte. There was joy, singing of Christmas carols, both by the visitors and inmates, food and gift distribution. It was a joyful experience. 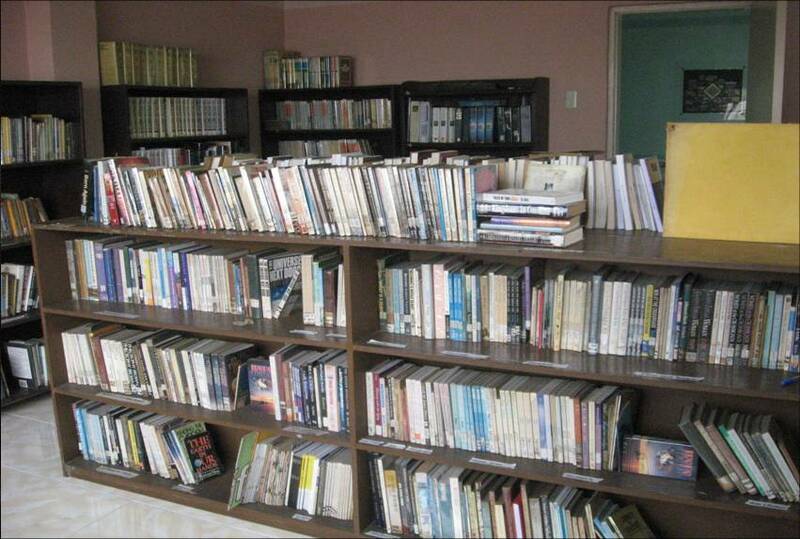 Erika Basas Encina, a teacher at Tanauan School of Craftsmanship and Home Industries in Leyte wrote: “The inmates are very welcoming, I really felt so blessed by their eagerness to listen to God’s Word. But before sharing the Word, we sang a Christmas song to them and they sang with us. I really felt God’s presence, and we were enjoying the Spirit of Christmas. But the moment we started the praise and worship songs, everything changed in a snap. They were so touched by how God loves each of them through the songs. They were touched by the Holy Spirit and I saw them humbled with tears falling from their eyes. They may look strong and violent as evidenced by their well-built physical features with tattoos all over their bodies yet they cried out to God loudly because of God’s love. I witnessed God’s work in their lives. Indeed, only God can change the hearts of people. I also felt blessed to see them moved when the inmates started to sing another song entitled “Kay Buti-buti Mo Panginoon.” (Lord, You are so good).” The way the sang this song really manifested their surrender to God and acknowledging God’s goodness in their lives. This is one of the activities where I really was moved and overwhelmed by God’s doing. These are the year-end MEANS ministry projects in the Philippines. We collaborate with our local ministry partners because they have the information, network, capacity and volunteers. 1. Care of Creation – We plant fruit trees native to the local community. The trees will help in greening, clean the air, prevent erosion and flooding in the community. b. San Carlos City, Negros Occidental – bamboo seedlings will be planted along the river banks. In the future, the community can harvest the bamboo for bamboo by-products. 2. Prison Visit – Our goal is creativity in reaching out to the inmates by sharing Christ’s compassion and bringing the true spirit of Christmas. 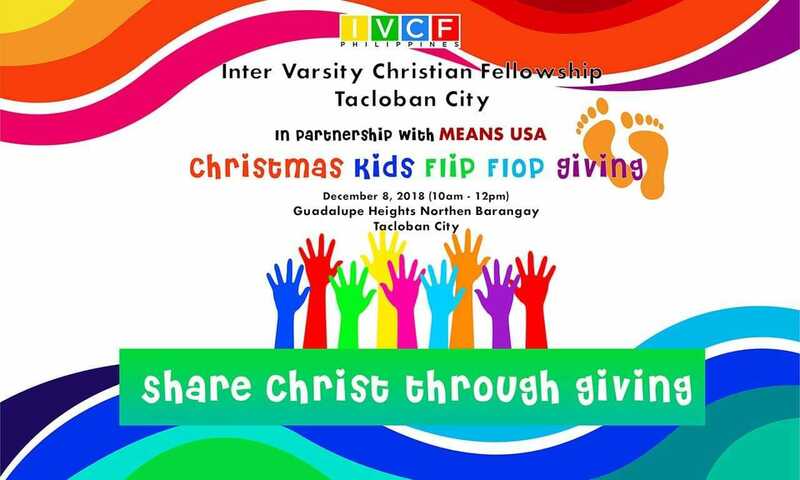 There will be a Christmas program, distribution of flip-flops, goodies and Christian literature. 3. Work for a Cause – Send one student. Serve one Community. What is work for a cause? MEANS believes that helping students financially to attend student training seminars should not be a dole out but something that the students will have to earn by cleaning or painting school toilets. 4. Protect Children. Child Advocacy – Partnering with local ministry organizations engaging in advocacy that typically seek to protect children’s rights. Posters – we want to reproduce these and distribute to schools in Bacolod. a. Human trafficking Awareness Program, Bacolod City. MEANS will sponsor local teachers, church leaders and school administrators to attend this seminar. 5. 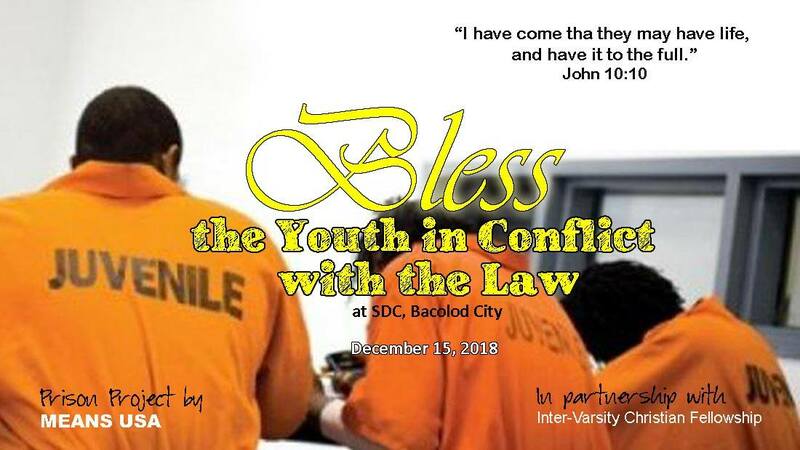 Youth Day – There will be gift giving so the youth will experience the compassion of Christ through this event. Youth day camp is a memorable experience in a child’s life. The opportunity to play games, make new friends, and learn about God’s love in a fun environment is a rare experience for the children we serve. Youth day. Agents of change.